The other day, my friend Lynn wrote an inspiring column about a recent trip to the farmers market in which she waxed poetic about the first time she tried arugula. 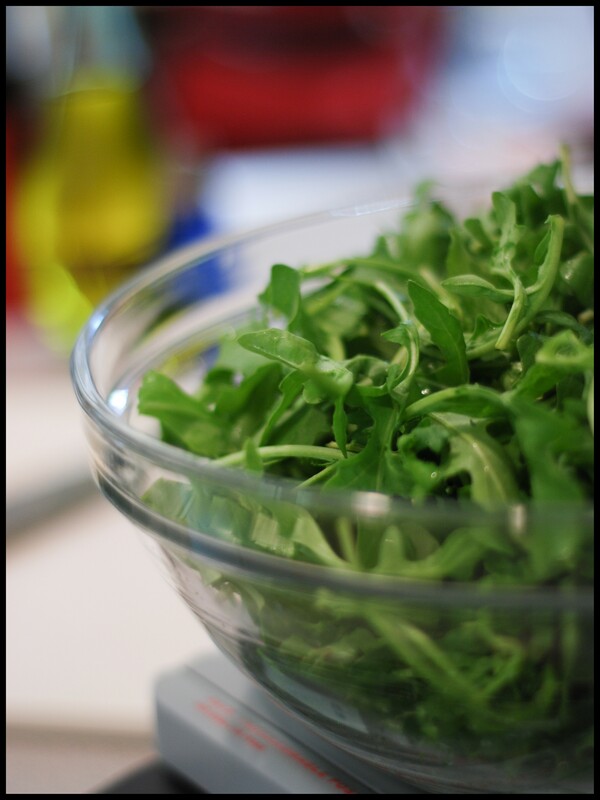 I love arugula, and when I woke up at six am on Saturday morning and knew I wasn’t getting back to sleep, I jumped out of bed, donned a baseball hat and headed to the farmers market in Matthews. It was actually the first day of its 20th season! I always stop at the Newtown Farms booth first because I used to share a share in their CSA program, and I can always count on them for amazing, organic produce. Newtown Farms is owned and operated by the Koenigsburg family, and the way all 8 kids work together out there is a beautiful thing to see! There are usually a few of them helping out on the weekends at the market as well. Anyhoo…they had some beautiful spinach, arugula and a nice lettuce mix. I had to grab a bag of each. Ooh, kale! Gotta have some of that, too! Then I walked over to another stall and picked up some pea shoots. By the time I noticed the bunches of romaine at another, I stopped in my tracks, a little dizzy, with red lights going off in my head. I think I actually did a little 2-step for a few seconds – taking a step forward, then a step back – totally flustered, before I came to my senses and made a deal with myself. “YES! I’m going to get all this stuff and the challenge is that I consume it all as quickly as possible! Gonna follow through on that goal to make salads a regular thing in the house. I can do this!” And I bought the romaine…then added some mushrooms, two dozen fresh eggs, and a couple pepper plants for good measure. Yesterday I had a big salad with a mix of everything, but today I wanted something a little more thoughtful and creative. 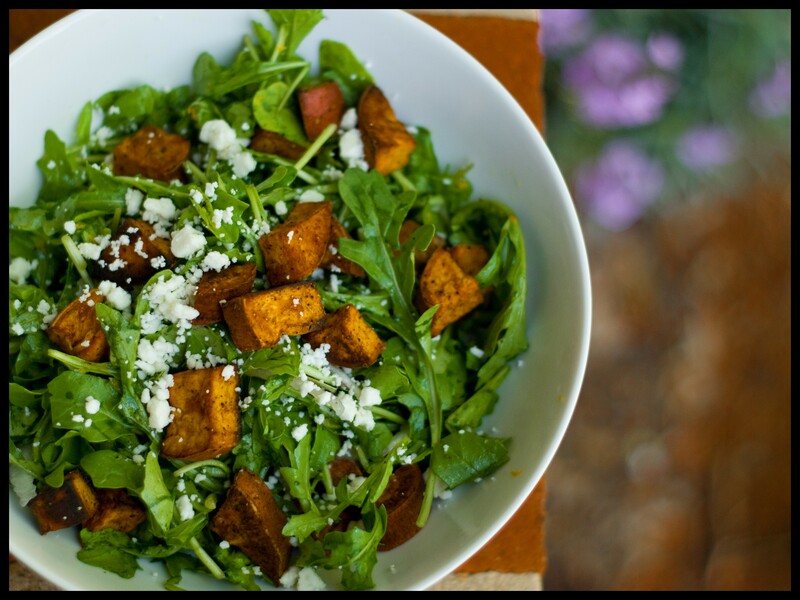 We roast sweet potatoes all the time around here, and it occurred to me that those would be wonderful mixed with the spicy arugula. 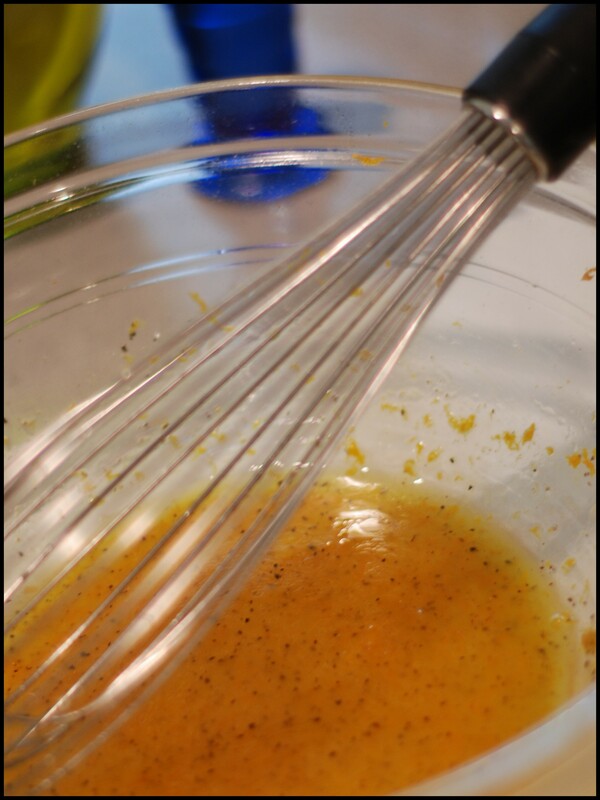 Since I almost never make salads at home, I generally use a bottled dressing, but I wanted something a little more special for this, so I did a quick search, and this is the first recipe I came across. (Thanks, Martha Stewart!) It looked perfect, especially since I actually had all the stuff here. I roasted the sweet potatoes tossed with olive oil, garam masala and a little ground chipotle pepper – it’s a nice blend of sweet and spicy. After mixing the dressing into the arugula, I added some thinly sliced red onions and decided to add a little feta. 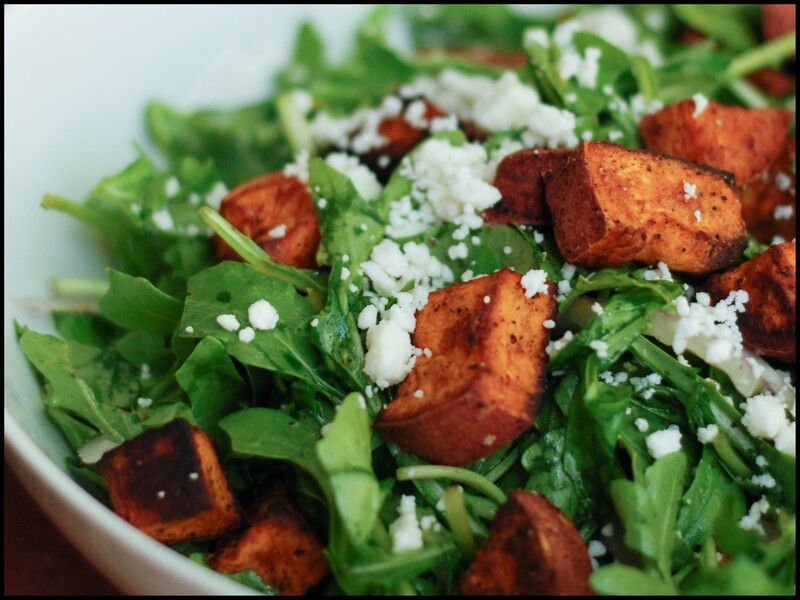 Honestly…this is one of the most tasty dishes I’ve had in some time; the sweet potatoes are the perfect accompaniment to the bold flavor of the arugula, and the feta adds a nice little punch. So simple, so light, so fresh…truly divine. 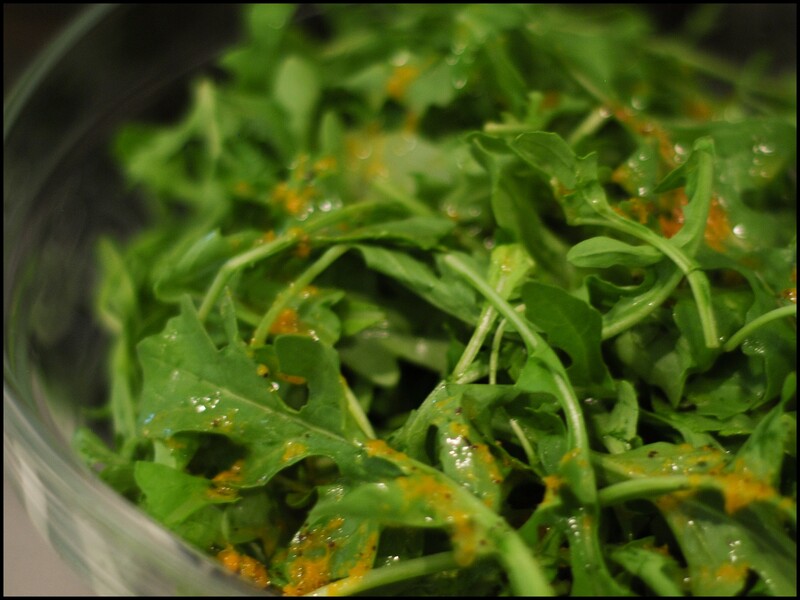 My only regret is that I didn’t buy more arugula so I could have it again tomorrow. a few dashes of black pepper.